GROHE SmartControl Concealed in combination with the new GROHE Rapido SmartBox. One for all! Until now, for the operation of a hand sprayand a showerhead with two types of spray modes, two rough-insand two mounting kits were necessary. With the GROHE Rapido SmartBox and the GROHE SmartControl Concealed models these can now be operated simultaneously with only one rough-in and one mounting kit. This allows the control of up to three shower or bath filler functions with only one trim. Push, rotate, and take your shower! The SmartControl user interface not only presents a visual statement, it can also be operated intuitively. In addition to the simple control of the different spray modes – by pushing a knob, you can start or stop your desired spray mode – the volume controller integrated in GROHE SmartControl also allows precise control of the water volume. Simply rotate the knob. By the way, the rotary knobs are corrugated and can therefore be used very easily. The SmartControl knobs are supplied with clearly and easily recognizable symbols for the different shower or bath options. Ultra slim design and more freedom of design! 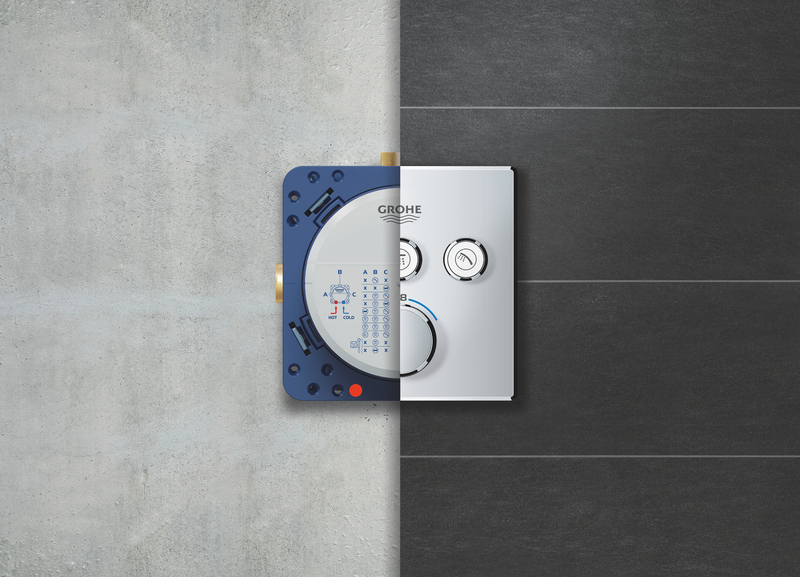 The GROHE SmartControl Concealed models project only 43 mm from the wall regardless of the installation depth of the rough-in and the GROHE SmartControl wall plate is only 10 mm deep. Thus, they make for a cleanand modern appearance and provide comfortable room to move while in your shower. They are available in round or square designsas well as in chrome and moon white finishes. The integrated sealing system completely eliminates any water behind the wall. Less installation effort atlower costs! The GROHE Rapido SmartBox has three outlets for a wider range of showering options, for which previously two rough-ins were necessary. In addition, the GROHE Rapido SmartBox makes adapters practically unnecessary. It has ½ inch outlets to which all standard cables can be connected. Inlets from below! The GROHE Rapido SmartBoxes equipped with inlets to be connected from below, which allow a direct connection to the hot and cold-water supply. The use of 90-degree fittings is a thing of the past. Subsequent adjustment by 6 degrees is possible! 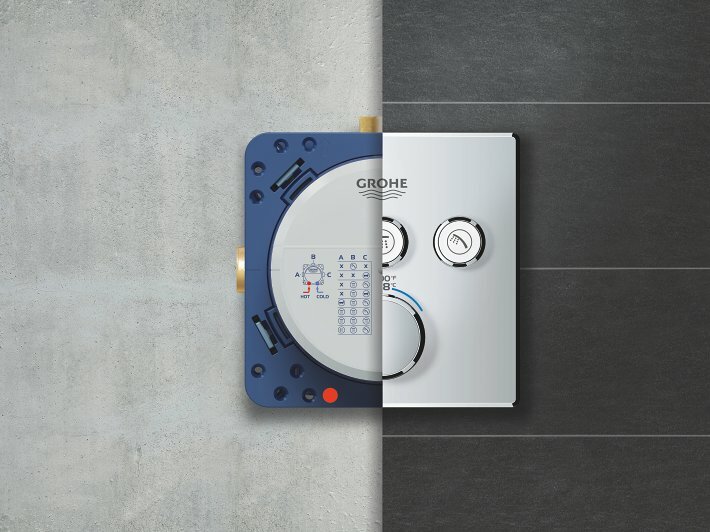 Thanks to the long holes in the functional unit, GROHE wall plates can be adjusted by up to 6 degrees and can be aligned perfectly with tiles and joints. Fits into every wall! With an installation depth of only 75mm, the GROHE Rapido SmartBox fits into every kind of wall, even particularly narrow ones. Service stops for retrofit! 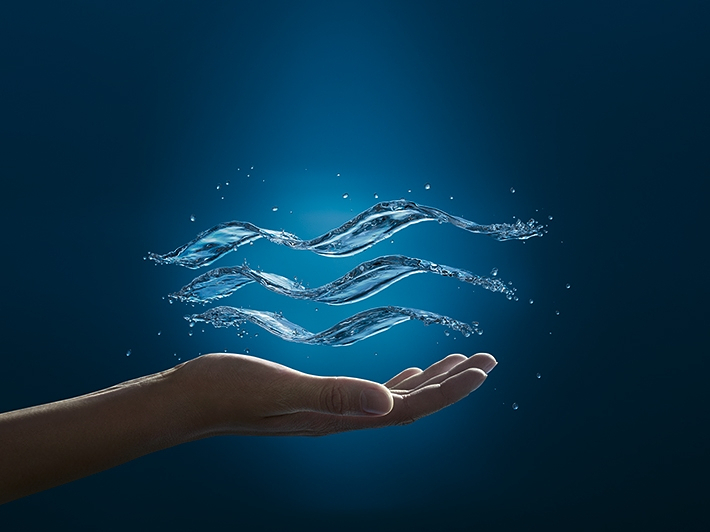 Thanks to the optional service stops for retrofit, the GROHE Rapido SmartBox allows complete control over the water supply in just a few steps. During maintenance, each of the building’s SmartControl fittings can be closed directly and separately. Service stops are optionally available for the GROHE Rapido SmartBox and can be easily retrofitted. Standards compliant! The GROHE Rapido SmartBox can be retrofitted with a safety protection against backflow and meets the EU standard 1717 when installed with a bath filler. Easy job-side installation! Thanks to the handy brass outlets, the connection to the pipes can be installed with the help of a pipe wrench so that the mounting on-sitecan be carried out fast and easily. A bench vice is not necessary. The temperature at which the water flow is to be started when a button is pushedcan be pre-set on the thermostat handle. The revolutionary GROHE TurboStat technology maintains the desired temperature within a fraction of a second and keeps it constant throughout the entire showering process. The Grohtherm thermostats are equipped with a 38 degree Celsius Safe Stop button and can be complemented with an additional temperature limit stop at 43 degrees Celsius. In addition to the TurboStat technology, the GROHE SmartControl Concealed model continues to be available with the proven SmartControl mixers, which combine simple operation with conventional manual mixer technology. They are also available with one, two or three shut-off valves, and also have built-in dirt filters for longer durability and easy maintenance.